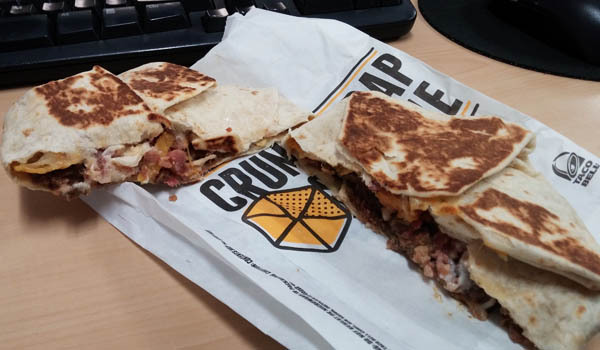 Over the last year or so, we have seen many iterations of the Taco Bell Crunchwrap, including the AM Crunchwrap, Crunchwrap sliders, and the Chickstar. 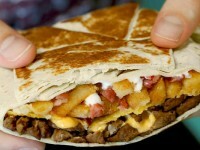 The Crunchwrap concept is fantastic, as it allows Taco Bell to fit numerous items into a hand-held food delivery system. 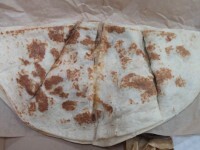 Here is my review of the Steak and Potato Boss Wrap. These normally cost $4.99, but I picked one up for just $2.50, using the current Visa Checkout promotion in the app. The Steak and Potato Boss Wrap features a double portion of steak (I’m not really sure what that is compared to, but oh well), crispy potatoes, bacon, chipotle sauce, reduced fat sour cream, a three cheese blend, and a tostada shell all wrapped in a grilled flour tortilla. I found the Boss Wrap to be very complex in its presentation, with each bite having multiple textures and levels of flavor. This is due to how the Boss Wrap is constructed. The tostada shell acts as a barrier between two sides. One side has the steak and the chipotle sauce, while the other has the bacon and potatoes. This creates the obvious problem where one side is really moist, while the other side is quite dry. Instead of all coming together in your mouth, half of the experience is dry potatoes while the other half is a steak/chipotle combo. Let’s talk about the ingredients a little more. The steak was definitely the hero of the Steak and Potato Boss Wrap. There is a huge portion of steak, and I felt the steak was juicy and tender. It had more of a roast beef texture. While it is still steak from a fast food restaurant, I felt Taco Bell has done well with it. The steak/chipotle combo was delicious. I have always been a big fan of Taco Bell’s chipotle sauce. It appears they used a slightly spicier version (probably a hold over from the Mild Chipotle Daredevil Griller). The crunchy tostada shell that acted as a barrier between the ingredients wasn’t very crunchy by the time I started eating. Like most crunchy items inside of warm tortilla shells, this started to soften quickly. The potato/bacon mixture was very ordinary. The crispy potatoes tasted bland, and sort of chewy. I could have preferred a sauce to augment the flavor of the potatoes, but for the most part, they seemed like filler. 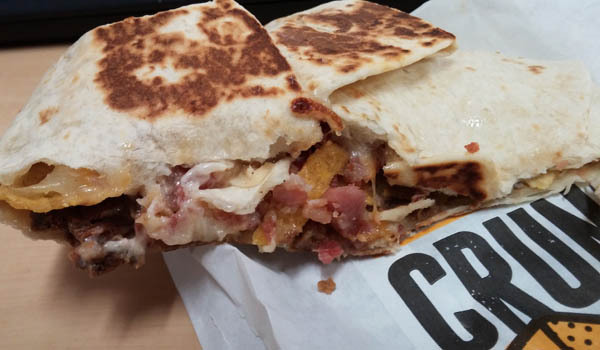 The bacon was the typical bacon bits from other Taco Bell items. The potato/bacon combo did better than the potatoes alone, but as I said earlier, it was too dry. 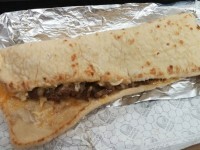 Overall, I the Steak & Potato Boss Wrap was delicious, but there were certain areas that could be improved on. I was impressed with the complex flavors that added extra dimensions to this item than a typical Taco Bell item. While I would have liked more sauce, a lot of people would argue that there is a nice balance between the more juicy side with chipotle sauce and the dry potato side. I would give the item an overall score of 4 out of 5, but the price really kills it for me. Steak is a premium item at Taco Bell, and because of that, they demand a premium price, but $4.99 is too expensive in my opinion. I would prefer paying around $3.99, and would like a chicken/beef option for $2.99. When I look at comparable menu items that have been $5 (XXL Nachos, Cantina Bowl, etc) this doesn’t really match up. I haven’t been impressed with Taco Bell’s steak previously (Read my review of the Triple Steak Stack), but I felt this time it was delicious. There are some balance issues between dry and moist, but overall the complex flavors and textures make this a winner. 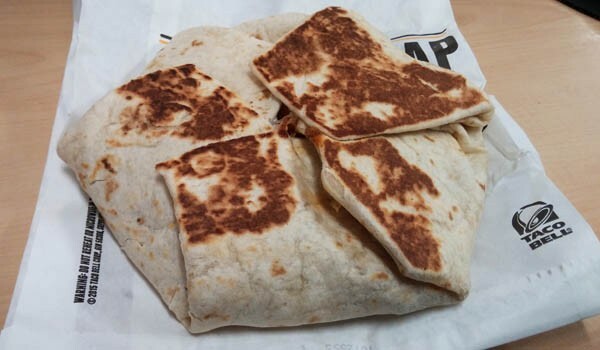 The price is too high for a Taco Bell item, which will probably hurt the popularity of the Steak & Potato Boss Wrap going forward.